Not the prettiest map in the world, but you get the gist. Further posts will explain each segment of the route in greater detail. With a whole month to do whatever we like, in a country with great public transport, there are any number of ways we can tackle this one. On our previous tours, facilities were much more limited, so we weren't quite used to the freedom that this one gave us. It took a couple of tries, much research, lots of discussions, and a very informative dinner with Da-Woon, Jess’s best Korean friend, before we decided on a route that we thought would allow us to get all we wanted from this trip. And even then, we know by now that things never go entirely according to the script you wrote in your home on the other side of the world. Here’s an insider tip - the best Korean restaurant in Berlin is at Da-Woon’s house. Call to reserve today! The Four Rivers Bike Trail will be the foundation of the tour. 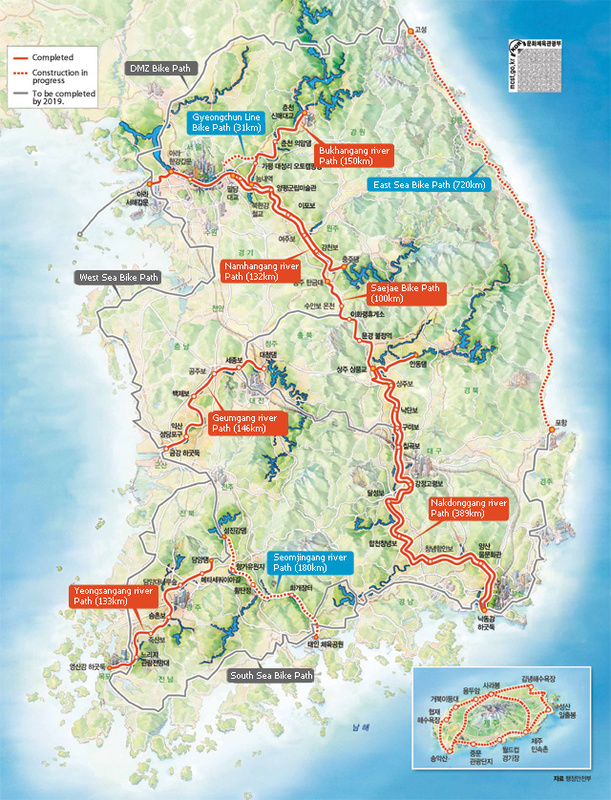 Claimed (by the Koreans) to be the world's longest bike path, it connects the Han, Nakdong, Geum, and Yeongsan Rivers to create a network of bike-friendly paths across the country spanning 1,757 kilometres. Our plan is to set off at the start of the trail not far from Incheon Airport, cross the country to Busan in the southeast, make our way west to Gwangju, and then loop back up to Seoul, all in 27 days. On many of the more populated parts of the path, you can find convenience stores facilities to stock up on snacks and drinks, repair stations for tweaking your bike, and motels aplenty for sleeping. Not to mention the innumerable restaurants and historical sights close to the trail which afford you a chance to rest and look around. The Koreans have really taken care to ensure that this ride is as pleasant and gratifying as possible, for foreign visitors as well as their own people. Most people who attempt this ride only do the path from Seoul to Busan. One of the many minimarts that dot the path out of Seoul. Notice how many people (all of them, except us) are locals. HOW ARE WE GETTING OUR TANDEM THERE? Once we decided to do this trip in the spring, it was easy enough scouring airline websites to find a good deal. They say that six weeks prior to any flight are when costs are lowest, but we found the bargain of a lifetime in December, 7 months beforehand. Air France was offering a roundtrip ticket from Berlin to Seoul via Paris for €480 with a decently short layover. We had to do a double-take and see if there was any catch, as it seemed too cheap to be true. Nope, turns out that we were just lucky (for once). You will need to make a request to check-in any sports equipment via this website - each bicycle can weigh up to 23 kilos, so we cheekily registered just one split across two boxes. Their Customer Service team coped admirably with Jess’s unique brand of incessant questioning. All requests are approved in plenty of time for takeoff. While facilities like these may sound like a dream for any cycle tourist, it doesn't come without a cost. A moral one, that is. The entire Four Rivers project was conceived back in 2008, when Lee Myung-bak, the 10th President of South Korea, was running his campaign for presidency. Back then, it was known as the Pan Korean Grand Waterway, and the goal was to revitalise the 4 rivers, their corresponding 14 tributaries, and scores of smaller connecting streams. Through this, Korea would be able to secure abundant water resources to combat water scarcity, implement comprehensive flood control measures, improve water quality and restore river ecosystems, create multipurpose spaces for local residents, and boost regional development centred on the rivers. While this all sounds brilliant in theory, the reality was more sinister. Before he ascended to the presidency, Lee Myung-bak was the former CEO of Hyundai Engineering & Construction Co. Ltd, and the public immediately cried foul with accusations of nepotism and environmental recklessness. There was also controversy around the lack of democratic process and local input, and a study done by the Korea Water Resources Corporation (K-Water) in 1998 when this concept was first proposed showed that the project would ultimately be economically and technically unfeasible. At the time, it was scrapped and shelved, so when the Four Rivers project came up ten years later, people viewed it with suspicion that it was merely the same old, just renamed. Problems notwithstanding, the Four Rivers Project continued on under the leadership of President Lee and was officially unveiled in October 2011. Whether the goals set in the beginning have been attained or not still remain to be seen. Along the path to Suanbo. Why are we doing this, then? How could we, if we know that some of our money will be going back to the government’s hands, thus perpetuating the chain reaction? We asked ourselves the same question when we went to Burma, where the moral objections there were even stronger, and came to the conclusion that all countries have corrupt leadership. You can’t escape it, and if you choose not to visit a place because of it, you miss the opportunity to give something directly to the people. Instead of eating at a name brand restaurant chain, walk a bit further into the neighbourhood and find a tiny joint owned by a wizened couple who offer no-nonsense delicious eats at a third of the price. Go beyond the big cities into the countryside and stay in a tiny town whose last foreigner visited decades ago during the war. This is how you can support small businesses who are slowly getting snuffed out. Make an effort to not follow the herd, and who knows what treasures you will find.